Sometimes it’s all about the details, you don’t need many, but having a few cute detail DIY projects in the bag can really help when it comes to putting everything together on the big day! 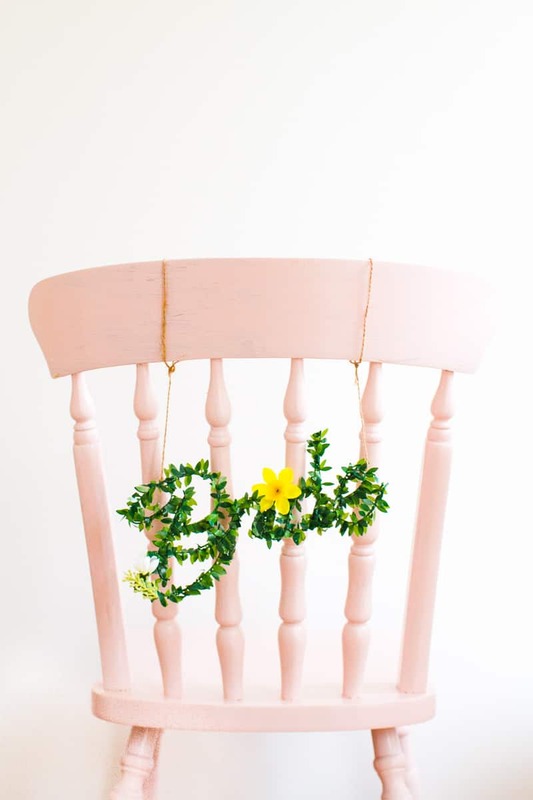 Today we’re going to be sharing a really easy bride / groom chair hang DIY which you guys can easily make in an afternoon and then pop away ready for the wedding! I just love how darn adorable they look on Emily’s pink chairs! Start by printing off the word bride and groom in a font that you like, you’ll need to pick a cursive font so that all of the letters join up. Next cut a long piece of your wire and start folding it into the shape of your word, you can do most of this with your hands but you’ll need to use the pliers for the tighter curves, I also found that it helped to use the floral tape to keep certain parts of the word together once I had bent them. Repeat this with your other word, whether you’re making bride and groom, bride and bride or groom and groom. Then, tie your string or yarn onto each side of each of your words so that they’re ready to hang. Now it’s time to start glueing! Warm up your glue gun and start applying glue and foliage to the beginning of your word, keep going until you’ve filled both of your words with foliage. Finally, add on a few faux flowers using your hot glue gun and allow the words to fully dry. Ooh I love this idea! They look so simple to make but such a great way of adding a bit of personality to the day, I’m going to have to give this a go myself for a dinner party I’m hosting soon!